I have to admit, I worried I didn’t know enough about E.B. White to do justice to this book. I’m a huge fan of Charlotte’s Web; but who isn’t? Though I needn’t have worried; Sweet did all the work for me, and beautifully too. For anyone else who wonders if a book about a writer they remember from childhood tales (and perhaps that Freshman English guide) may be outside of their bailiwick? I say dig in. With Some Writer!, Sweet has made the author’s life come alive. Don’t be surprised if you find yourself wrapped up in the wonder of it all, just as much as your friendly neighborhood little ones will be. 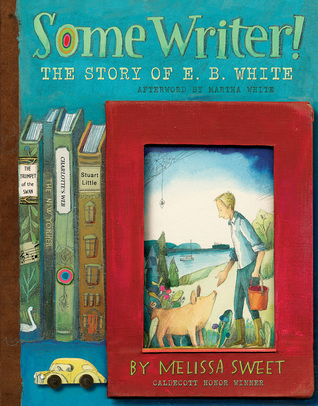 Sweet uses words and mixed media to tell White’s story, making Some Writer! fascinating on many levels. As adults often sneak healthy stuff into meals, Sweet makes the often dry and dusty realm of biography delicious with her easy-going, lighthearted style. White comes across as a genuinely nice man. A true gentle-man gentleman. I love how Sweet breaks down things for her readers. “How a Manual Typewriter Works” is fun for folks like me who remember ‘em, but probably a fascinating look at old-timey stuff for her YA target audience. The page is beautifully rendered to boot. Charlotte’s Web: based on his farm life, a story brought about by the death of a pig…and White’s wish to write about how one could be saved. My favorite tidbit of Sweet’s extensive research? That White stayed true to spider behaviors while writing this story. How lovely! In fact, Sweet includes a lot of information on how White started out writing Charlotte’s story, which is a nice peek into the mind of a writer. Complete with pages of his actual notes! Oh how I love Sweet’s mixed-media approach. I truly do. And I’d no idea E.B. White worked for The New Yorker! Then again, I’m not really cool enough to read The New Yorker with any sort of regularity. That could be the problem. But White’s start in New York is fleshed out with anecdotes, pages of real-life notes, and Sweet’s lovely illustrations. As for his work on Elements of Style, it’s an engaging introduction into how White got into adding to Strunk’s seminal work. Sweet includes great tips from White’s additions that I realized I use quite often. (I really should use them more.) Sweet also references other writers, and how they themselves use White’s tips. It’s a tribute to the widespread appeal of this classic guide. All this, and a bat poem by Joyce Sidman, one of the writers Sweet references… how can anyone ask for more? Sweet has now been added to my list of favorite biographers; I have a strong need to read her other books, especially The Right Word: Roget and his Thesaurus, and A Splash of Read: The Life and Art of Horace Pippin (which were written by Jen Bryant and illustrated by Sweet). But mostly, I hope Sweet continues to publish lovely, engaging YA biographies. I’ll be front and center for every new release. This entry was posted in Books, Elsewhere Reviews, Green Man Review and tagged Book Reviews, E.B. White, Elsewhere Reviews, Green Man Review, Who Doesn't Love Spiders?. Bookmark the permalink.